We invite you to explore India - the Land with infinite beauty ! Whether you soar high into Himalayas or peer under the ruins of the Ancient monuments dotting the landscape of India, you will cherish the experience long after your visit ! This India Travel Guide on Puri Jagannath Temple is free from any commercial interest! This site is dedicated to promote India - the vast subcontinent, its glorious past, magnificent landscape and its infinite variety. Puri Jagannath holds a unique place in the hearts of the devotees for its antiquity, grandeur of festivals, sculptures and architecture. 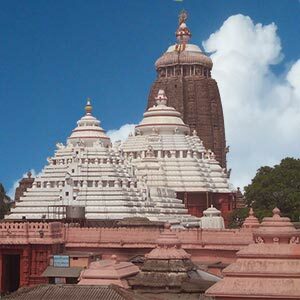 Jagannath temple is located in the town of Puri, in Orissa. This temple is highly revered by devotees as it is one of the 'Char Dhams' (four divine sites) located in all four directions of India. From the terrace of a library opposite the temple, one can glimpse into the inner temple. The temple belongs to the 12th century and there is an interesting legend associated with the Jagannatha temple of Puri. It is said that King Indradyumna, the ruler of the territory, visualized Lord Jagannath in his dreams and was instructed to construct a temple dedicated to the Lord. Thus the temple was made with all devotion, in the heart of the holy city and since then the divine place has been attracting millions of devotees from all over. The presiding deity here is Lord Jagannath, an incarnation of lord Vishnu and worshipped in a triad along with his brother Shri Balabadhra and sister Subhadra Devi. It is by far the only temple in the world dedicated to the brother - sister affection, Shubhadra with Lord Krishna and Balaram. Here unlike other temples where idols are carved out of stone, the idols are made of Margosa wood and the idols are changed every 12 years. According to Hindu mythology, unfinished idols are inauspicious and not considered for puja, but here one finds that all the three idols are incomplete (hands and legs not completed) and still worshiped. There is an interesting tale behind this. King Indradyumna, after receiving instructions directly by the Lord himself in a dream, put the best carpenters to work and asked them to carve out the idols of Lord Jagannath, Shri Balabadhra and Subhadra Devi. It was believed that if the idols were viewed before completion, workers would not be able to carry on the carving work. Apparently, King Indradyumna could not resist himself and saw the idols before they were fully ready. As a result, till today we find the idols incomplete, without arms and legs! There is a small museum inside the temple where many handmade idols are kept for viewing. Built according to the magnificent Orissa style of architecture, the Puri Temple is spread over a 10 acre land and built on a mammoth raised platform. There are as many as 30 small temples inside the complex along with the main temple. Out of all the temples, the temple dedicated to Goddess MahaLakshmi holds special place and few of the other temples surrounding the sanctum sanctorium include the temples of Lord Narasimha, Kanchi Ganapathy, Goddess Saraswathi and Gowri. The structure of the main temple stands 214 feet tall and on top of the temple there is a wheel made of an alloy of eight metals (astadhatu) which is known as Nilchakra or the Blue wheel. Every Ekadasi, a lamp is lit on top of the temple near the wheel. This wheel bears the holy flag and every day a person climbs the tower and changes the flag. This flag changing ceremony which takes place every evening draws many devotees. The massive area of the temple is segregated into four chambers: Bhogmandir, Natamandir, Jagamohana and Deul. Jagannath Temple has four entrances from four directions enhancing its appearance. Gates on all four sides have carved stone images of lion, elephant, tiger and horses. Devotees enter through the east gate and take the flight of 22 steps before entering the main temple. After crossing the eastern gate, there is a huge pillar at the entrance known as Aruna sthamba. History says that this pillar originally belongs to the Sun temple of Konark and was shifted to Puri. These 22 steps are known as Baaisi Pahachas and are replete with the Hindu spiritual significance. It is considered sacred to roll down the infants from the top of the steps. The temple is enclosed by two compound walls, the outer one known as Meghanada Pracira and the inner one known as Kurma Pracira. It is believed that Lord Jagannath was bothered by the roaring of the waves and hence this huge wall was built to check the sound. It is amazing that as a devotee embarks on the flight of 22 steps, the noise of the sea fades away. Devotees normally take the darshan of Lord Shiva at Biswanath mandir; situated to the left of the Baisipahacha before entering the sanctum sanctorum. Inside the sanctum sanctorum, the massive raised platform measuring 16 feet long, 13 feet wide and 4 feet high known as Ratnavedi or Mahavedi houses the wooden idols of - Jagannath , Balaram and Subhadra, adorned with large jewel on forehead namely - hira , mukta and pannais . The entire temple structure is said to resemble a human body; signifying the Hindu philosophy that we find God not just in the temple but within ourselves. Since its inception, traditionally few communities have been assigned with the administration and maintenance of the temple. People belonging to these communities who carry out the daily rituals are called sevayats. Gajapati, king of Puri is the first sevayat of the temple and nearly 75 sevayats work for the temple on any given day sharing different set of duties. The majestic Rath yatra or car festival of Lord Jagannath at Puri is a world famous event that takes place annually during the months of June and July - two days after the new moon day in the Hindu month of Ashadh. This festival is a way of paying tribute to the journey of Lord Krishna from Gokul to Mathura. Thousands throng the city to witness this ceremonial procession. The beginning day of the Yatra is observed as a public holiday in Orissa and the entire festival is stretched over 8 to 10 days. For the occasion, three gigantic chariots, one each for Lord Jagannath, his brother Balbhadra and his sister Subhadra roll out carrying the idols. The main chariot is 14 mts high, 10 mts wide with 16 wheels whereas the chariot of Balabadra is made with 14 wheels and the chariot of Subadra devi bears 12 wheels. These three chariots are made every year with Sal wood by a special group of carpenters who have traditionally taken up this sacred responsibility. These chariots which resemble the temple structure, are taken out on a procession to Gundicha Mandir,(which is about 3 km away from the main temple) where the idols are kept for a week and then are brought back in the raths, to the Jagannath Temple. As a part of ritual, all three deities will stop at the Mausima Temple on the Grand Avenue and taste the famous Podapitha (rice cake, a favourite dish of Lord Jagannath). In English Language - there is a word - Juggernaut - which owes its origin to this Puri Jagannath Rath - where some devotees hurled themselves at the massive wheels of the chariots which continued to move inexorably and remorselessly. Initially, before the procession would begin, the King of the Puri kingdom would come and sweep the chariot with the golden broom proclaiming himself to be the first servant of the Lord. Continuing the tradition, till today, Gajapati (the ceremonial King of Puri) sweeps the chariots with a golden broom and sprinkles holy water on them. The blowing sounds of conch shells and the volume of drum beats and millions of people pulling the ropes of the chariot - a visual treat indeed! The kitchen of the Jagannath temple being the biggest in the world needs special mention. It is located at the south-east direction of the outer compound of the temple. The length of the kitchen is around 150 feet, breadth is 100 feet and the height is about 20 feet. This mammoth kitchen consists of 32 rooms with 250 earthen ovens. Every day hundreds of cooks prepare food in this temple kitchen, often at short notice for thousands of devotees. Mahaprasad or Naivedhya offered to Lord Jagannath and his siblings at Rathnavedhi is prepared and supplied by this temple kitchen. Every day, the offerings, (consisting of 56 varieties of dishes), are made six times starting from morning breakfast to late night meal which ends at 11 in the night. Later this is distributed amongst devotees at Ratnavedi and at Bhog mandap. These daily offerings of Prasad are carried on elaborately. There is an interesting reason for giving so much of importance to these daily offerings and the maintenance of the kitchen. It is believed that Lord Vishnu conducts each of his daily activities at each of the Char Dhams (four holy places). He takes his bath at Rameswaram, meditates at Badrinath, dines at Puri and retires at Dwarika. Hence, a lot of significance is given to "Mahaprasad" at Puri. One more place that draws large crowds in the temple complex is Ananda Bazaar (The market area of Mahaprasad )which is located on the right side of the 22 steps. Here, thousands of devotees purchase the bhog and relish the delectable delicacies containing rice, lentils, vegetables and sweet rice pudding. Few tourists even pack and carry the dry bhog consisting of special sweet called 'khaja'. They are typically packed in palm leaf packets to retain the flavor. Parking space for vehicles is located nearly a km away from the main temple. So visitors can either walk the distance or avail the bus service provided by the temple authorities. Manual rickshaws also ply till the entrance. Mobile phones, cameras and leather items like waist belt and purses are not allowed inside the temple. So, before entering the temple, you can deposit the valuables at the counter specially meant for this purpose. After soaking in the divine experience at Puri Jagannath temple, tourists can head to the famous sandy beach to enjoy the waters. Unlike other prominent beaches, it is very safe to take a dip here as it is quite shallow. Bada Dhanda or Grand road, a 3 km stretch, which extends from main temple to Gudicha temple, is a shopper's delight.